FEECO International, Inc. was founded in 1951 as an engineering and equipment manufacturer. FEECO is recognized globally as an expert in providing industry-leading process design, a range of engineering capabilities, including everything from process development and sample generation, feasibility studies, to detailed plant engineering, as well as manufacturing to a variety of industries, including: fertilizer and agriculture, mining and minerals, power/utility, paper, chemical processing, forest products and more. 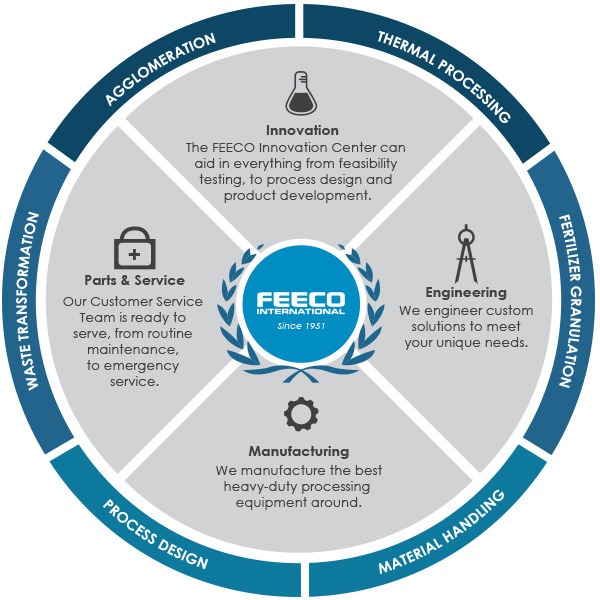 As the leading manufacturer of processing and handling equipment in North America, no company in the world can move or enhance a concept from process development to production like FEECO International, Inc. The choice to work with FEECO means a well-rounded commitment to quality. From initial feasibility testing, to engineering, manufacturing, and aftermarket services, we bring our passion for quality into everything we do. FEECO International follows ISO 9001:2015 standards and procedures.